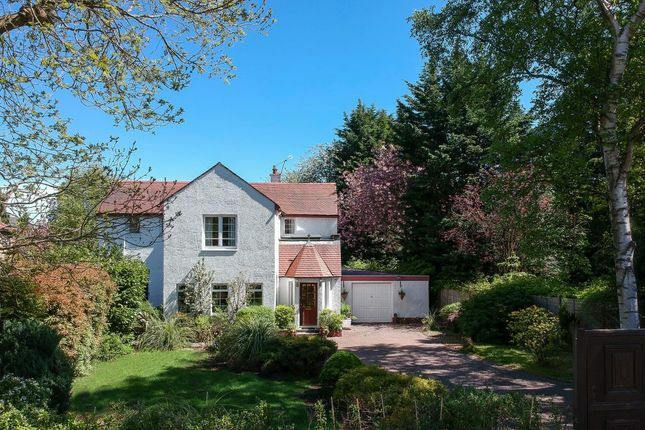 A charming detached family home boasting an idyllic, peaceful environment within one of edinburgh’s most sought after locations. The subjects of sale comprise a substantial detached villa which commands a fantastic location within one of the capital’s most highly sought after ‘hideaway’ streets, which is also home of the highly regarded Barnton Park Lawn Tennis Club. This particular property is set well back from street level, screened by delightful, mature gardens and an extensive driveway, suitable for off street parking for several cars and giving access to a tandem-style garage. To the rear, the gardens which are partly laid to lawn incorporating two patios, are a sun trap and fully enclosed by mature trees, ensuring complete privacy and security. Internally, this is a generous family home laid over two floors. The accommodation is extremely versatile and is ideal for the growing family. This property has been very well maintained by the present owners and a new gas fired central heating boiler was installed last year. There is further potential for cosmetic upgrading if so desired, giving any purchaser the opportunity to incorporate their own personal design, and with so many bright and wonderful rooms this would be an exciting but not onerous project. Davidsons Mains close by, retains a ‘village feel’ and offers a wide variety of small specialist shops and a Tesco Metro which provides for everyday requirements, whilst a wider range of shopping facilities is available at Craigleith Retail Park and the Gyle Shopping Centre. There are excellent schools ranging from nursery to secondary level nearby, including Cargilfield School, The Mary Erskine School; Stewarts Melville College; St George’s School for Girls; Fettes College, The Edinburgh Academy, and The Royal High School. For sporting enthusiasts, Barnton Lawn Tennis Club is 50 metres away and there is a choice of challenging golf courses including Bruntsfield Links and Royal Burgess also on hand. Delightful walks include Lauriston Castle with its Japanese Garden and parkland, Cramond seashore and woodland tracks along the River Almond and Cammo. For the commuter, there is a good choice of bus routes to Edinburgh City Centre and surrounding areas, and also easy access by car to the City Bypass, Edinburgh International Airport, the Forth Bridges and the motorway network.